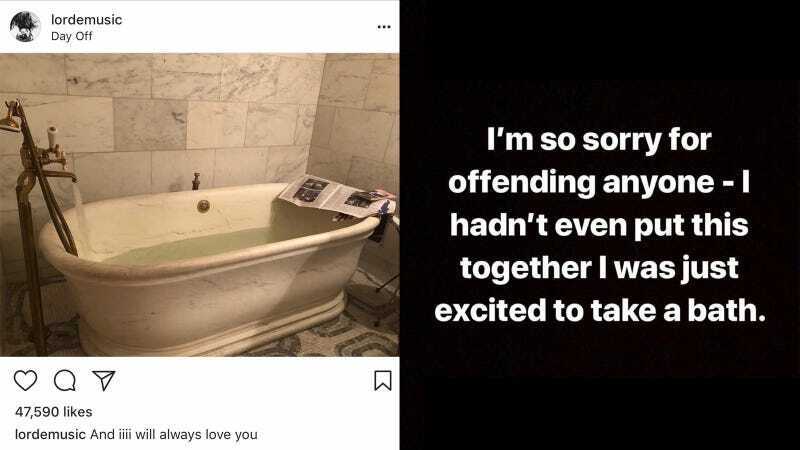 People (by which I mean humans, not the magazine) pounced on Lorde late Thursday after she posted a photo of a [positively gorgeous] bathtub with the caption, “And iiiii will always love you.” While the singer, currently in the middle of her Melodrama tour, made it fairly clear that the photo was about good old R&R (the location tag was “Day Off”), many viewers took it as a disrespectful reference to Whitney Houston’s tragic death. I believe it! Don’t you? What a weird, rude joke that would have been if she’d actually been referencing Whitney’s death. *RACHEL MADDOW VOICE* Watch this space.